When Do Persimmon Trees Bear Fruit? Is it Safe to Plant Near a Persimmon Tree? Persimmon trees are native throughout America and Asia. There are a number of varieties to choose from, and each has slightly different fruit. Fuyu and Hachiya are two Asian varieties favored by home gardeners. Persimmons are usually hardy between zones 6 to 10 although that may vary depending on the type of tree. Even without the bright orange fruit, persimmon trees have an interesting branch structure. However, light pruning is needed to keep these trees in top shape. Pinch all fruit off of the tree as it forms in the summer. Do not allow the persimmon trees to grow fruit until they are at least 4 years old. Remove any crossing branches at the time of planting and every winter. Cut back every branch by 2 or 3 feet in the winter of the second year. 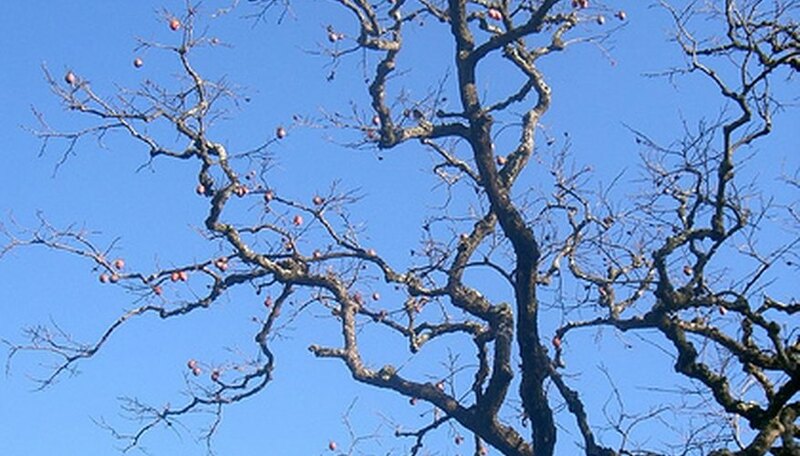 Prune your persimmon tree in the winter after the fruit has been harvested. Cut off any over reaching, dead or damaged branches at the base of the tree. Cut off any horizontal branches at the base. Head off each branch by one third to promote more fruit production. Leave branches with about one foot of space between them to increase the amount of sunlight that reaches the fruit. Remove root suckers and water sprouts as they occur year round. Persimmons are medium-to-large, fruit-bearing trees that grow naturally in China, Japan, Mexico and the southern U.S. Trees have been adapted from wild specimens. The most commonly grown types are American, Japanese or Mexican. Each type of tree has dozens of cultivars. Cultivated trees are often self-pollinating and grow well where the soil is moist but well-drained. Persimmon wood is very hard but is also brittle, necessitating protection for young trees. The tree has unusual form with drooping branches and fruit often ripens only after all the leaves have fallen. Persimmon trees can grow from 40 to 60 feet tall but are much shorter in their northern range. 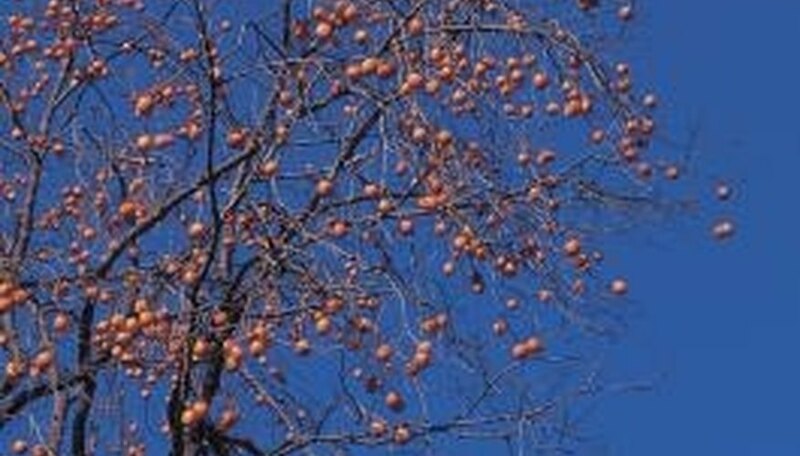 Persimmon trees can be invasive in their natural growing areas. The slimy fruit can present hazards if the tree is planted near sidewalks or outdoor living areas. The tree is a member of the rose family; like their cousins, many cultivars are susceptible to black spot and verticillium wilt. The United States Forest Service indicates that the blooming stage of the persimmon tree is dependent on the geographic location of the planting. The tree will bloom between March and June across its wide hardiness range and from April through May in areas in which the tree grows best. The persimmon tree grows best -- and thus blooms best -- in the rich soil of the bottom lands of the Mississippi River. It grows across a wide swath of the southeastern United States and thrives in the southern Atlantic and Gulf coastal states. It does not grow or bloom well in the Appalachian or Allegheny regions. 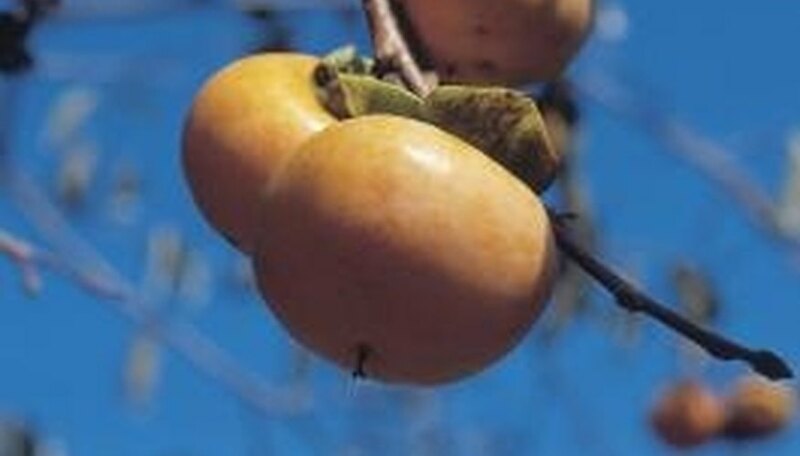 The USFS indicates that the persimmon tree waits a decade or more before it begins to bear fruit. The persimmon blooms will produce edible fruit after approximately 10 years, although the optimum fruit-bearing age for the tree is between 25 and 50 years. The tree should only be expected to provide an exceptional crop about every two years. Dwarf persimmon trees, such as the "Izu" variety, reach a fully mature height of 12 to 15 feet. These trees are more easily managed as compared to standard persimmon trees that may grow up to 40 feet tall. The "Izu" is the dwarf variety of the "Fuyu" persimmon. 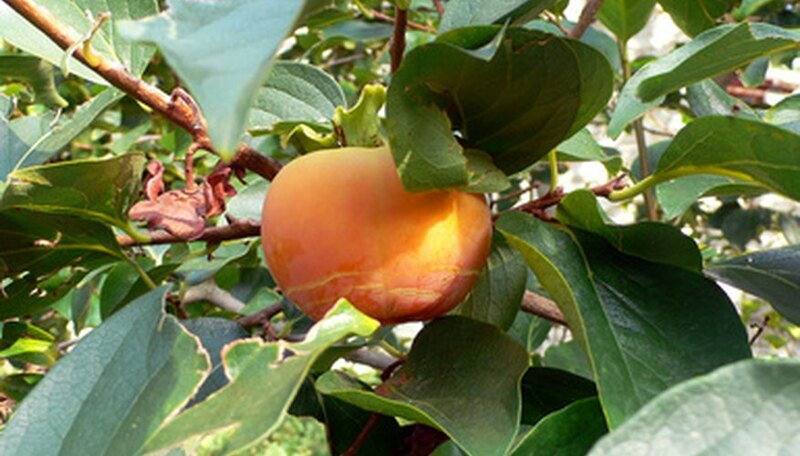 Native to China, the persimmon tree is a fruit tree that favors mild summers and moderate winters. 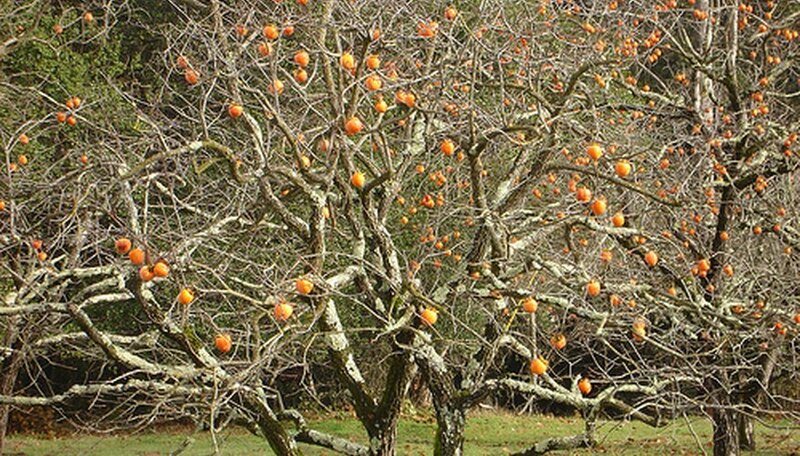 The persimmon tree is a thriving tree that can grow as high as 25 feet with branches extended just as wide. This multi-trunked tree is deciduous and creates astringent and non-astringent fruits, based on the selected persimmon tree type. Persimmon trees are ornamental and often reach heights of 25 feet at maturity. The leaves of this tree are a dark glossy green when mature and grow up to 7 inches long and 4 inches wide. Fragrant flowers in cream or light green grow in clusters. Mature trees bear fruit, which is a 2 to 5 cm berry that begins light green or yellow in color and turns red or orange upon ripening. Persimmon trees are slow to grow and do not reach great heights. Trees that are 10 years old often produce fruit, but the ideal fruit-bearing age of the persimmon tree is 25 to 50 years, states the United States Department of Agriculture. Premium fruit crops are produced every two years. Persimmon fruit is often used in puddings, cookies and custard. This fruit is sometimes used in its unripe stage to treat diarrhea and fever. According to the United States Department of Agriculture, persimmon fruit is eaten by wildlife such as fox, deer, coyote, bear and raccoon. Birds such as the wild turkey and quail may nibble on this fruit as well. Persimmon trees can tolerate and adapt to varying soil conditions as long as the soil is not salty. Persimmon trees prefer well drained loams that are deep within the ground. The tree has a strong tap root that will extend deep into the ground requiring deeper planting holes than other trees. These trees also prefer a balanced soil acidity that rests in a pH between 6.5 and 7.5. Persimmon trees require moist soil and proper irrigation. Though the trees can withstand short periods of drought, long periods of drought will cause permanent damage. The persimmon’s deep planting and strong root taps eliminate the need for excessive fertilizing. The tree prefers low levels of nitrogen, as excessive nitrogen can cause fruit drop. Examine the flowers of your persimmon when blooms are fully open. Using a magnifying glass, examine the interior of three or four flowers to make sure you have a representative sample. Look for a small central stalk, the pistil. This is the female organ of the flower, the place that catches the pollen released by the male stamens. In a female persimmon flower, it will be surrounded by a group of small immature stamens that do not produce pollen. Another clue that you have a female flower is that it will be a single cream-colored flower on the twig, not part of a group. Look for stamens in a ring around the the center of the flower. If you see no central pistil and there are a group of stamens, you have a male flower. Another indication would be finding the flower as part of a group of three pink-tinged blossoms. Select a complete 4-8-3 granular fertilizer, calculating the appropriate dose by using 1 lb. of fertilizer for each year of the Fuyu tree's age. Scatter the fertilizer evenly around the base of the tree in a wide doughnut formation at least a foot out from the trunk and extending at least a foot past the drip line of the tree. Mix the fertilizer grains gently into the top 2 inches of soil with a rake or cultivating fork to nestle it into the soil. Water the fertilizer and surrounding soil deeply until the soil is drenched to a depth of at least 12 inches. This will kick start the spread of nutrients down into the root zone of the tree. Remove the flesh from the fruit to expose the seeds, if you are using foraged fruit. A persimmon may have up to eight seeds per fruit. Place the seeds in a sealed plastic bag. Set the bag in the refrigerator for up to three months to stratify the seeds. Stratification, holding the seeds below 50 degrees F, is generally needed so the seeds will germinate. Fill the 6-inch diameter pots with a rich, loamy potting soil. Place three seeds in each pot at a depth of about 2 inches. Evenly space the seeds. Water the potting soil. Keep the soil moist. Depending on the variety, the persimmon seeds will begin to germinate in 30 to 60 days. Allow the seedlings to grow in the pot throughout the year. Transplant in the late fall when the seedlings have shed their leaves. Find flowers from blossoming persimmon trees so you can examine the blooms. Clip the blossoms from the trees to examine them closely. You will see light yellow blooms with four distinct parts in the shape of a bell. Measure the blossoms with the ruler to compare. Female blossoms are larger than male blossoms and generally reach approximately ¾-inch in diameter. Male blossoms generally only grow to a diameter of 3/8-inch. Count the stamens on the smaller male blossoms and you will see that they have 16 stamens. The larger female blossoms have only eight stamens and they are smaller than the male stamens. Notice the green calyx at the bottom of the blossoms. The female calyx is noticeably larger than the male calyx and is much thicker. Persimmon trees will compete for nutrients with companion plants, but those that tolerate shade and poor soil will grow near them. Good choices include gooseberry, chives and beans.